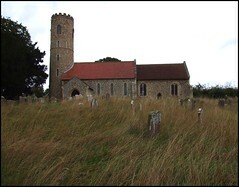 This parish is on the edge of the lovely town of Halesworth. 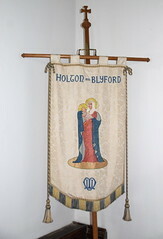 The name is to differentiate it from Holton St Mary, away in the south of the county, but in 19th Century directories the parish here is referred to simply as 'Holton'. Nowadays, it is home to one of the famous Bernard Matthews' turkey products factories, the biggest employer for miles. 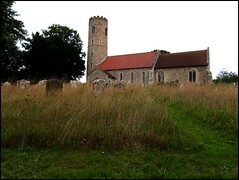 The church is on the main road, but set well back from it, at the top of a sloping churchyard. 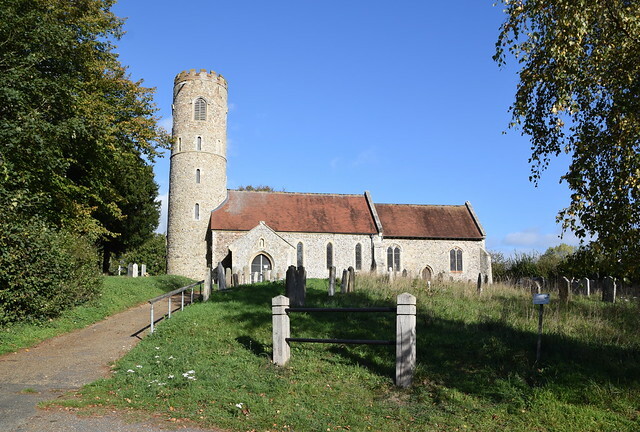 St Peter sits there, looking beautiful.The round tower is in two stages, and one of Suffolk's tallest, giving the impression that this is a big church, which it isn't. It's a dear little building, and open every day. 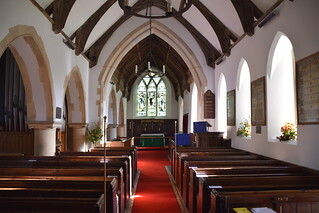 A modern statue of St Peter sits in the porch niche, and then there is a beautiful Norman inner doorway, probably the age of the lower half of the tower. Above it is a most curious Norman stone carving. 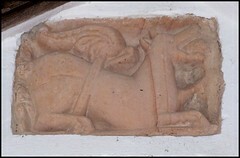 It shows a mythical beast of some kind, apparently winged, and holding something in its mouth. These things are more common to the west, but relatively rare in East Anglia where there seems to have been a will in late medieval times to do away with older superstitious imagery. I have heard it described as a winged bull, the evangelical symbol of St Luke, but I do not think this can be right. 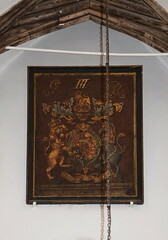 For others, it may be a dragon, and a dragon with a child in its mouth is the symbol of St Martha, which would be unique in East Anglia and unusual in England. But I think it is a wolf whose tail becomes a tree of life above its back, and not wings at all, and who is eating the leaves of another tree. A symbol of resurrection, perhaps? 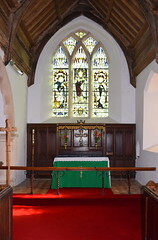 Similar images can be seen elsewhere in East Anglia at Santon Downham and Birchanger. You step in to a pleasant and sentimental Victorianised interior. 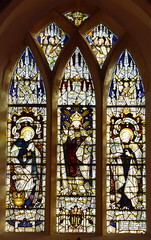 There's a grand window by Kempe & Co depicting the Blessed Virgin and St Peter flanking Christ in Majesty, not a workshop I am terribly fond of, but it is one of their lushest works in the county. 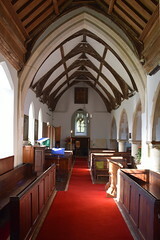 The north aisle gives the nave a sense of squareness. 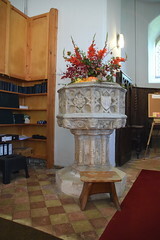 The font is old, there is a Georgian royal arms, but the overwhelming sense is of the 19th Century. Looking up this Parish in White's 1844 Suffolk, I was pleased to discover that the Rector at the time was the splendidly named Reverend Worship. He must have been one of those who transformed St Peter into the church we see today.